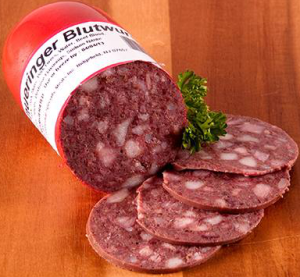 Blutwurst is a spicy, salty German blood sausage, often dark in color, almost black. Ingredients vary; it may be made from pork, beef, and beef blood, or from fresh pig's blood, diced pork, and pork fat, to which salt, pepper, and assorted seasonings are added. It may also contain fillers like bread or oatmeal. It is often eaten as a snack, or mixed with sauerkraut, in Germany. It comes already cooked, but may be heated before being served, though it can be sliced and eaten cold, on bread. Other names are Schwarzwurst (meaning black sausage), Rotwurst (meaning red sausage), Topfwurst (meaning pot sausage), and Blunzen. Blutwurst comes in varying sizes. Some are 6-inch links (2 inches in diameter). Other Blutwurst are large, bologna sized sausages.